Throughout the 21st century the Beta Delta chapter of ΑΤΩ has built a strong reputation of excellence on campus and nationally. The Beta Delta chapter and its members have been honored with over 55 awards since 2005, including Top Chapter among the National Fraternity and Order of Omega Most Outstanding Fraternity award. The late Amos Burns helped to spearhead the rejuvenation of the Beta Delta chapter through recruitment of members beginning in the 1990s. In 2011, our current chapter house was completed and, after 40 years, our chapter house moved back to University Boulevard. Today, the members of ΑΤΩ hold the second highest GPA among all fraternities on campus and are heavily involved in campus organizations including but not limited too Capstone Men and Women and SGA. Members of the Beta Delta chapter are also involved in leadership roles in all the major honors societies at UA. The Beta Delta chapter is now in its 136th year at Alabama and continues to uphold a standard of academic excellence and strong character. In 2010, the Beta Delta chapter received the Top ΑΤΩ Chapter award at the Biennial ΑΤΩ congress in Orlando, Florida. Our chapter receives a True Merit award almost annually at the national congress as well as many prestigious awards from Order of Omega at the University of Alabama including Top Fraternity on Campus. 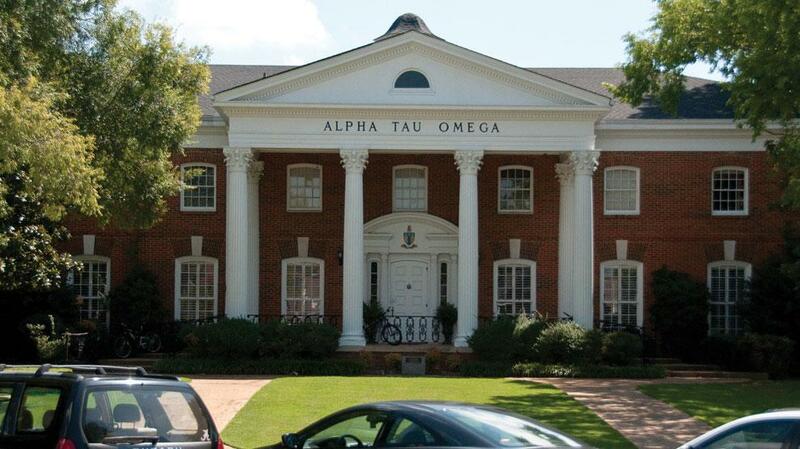 Beta Delta moved into its first fraternity house in 1910 on Queen City Avenue between the campus and downtown Tuscaloosa. We were one of the first fraternities at UA to have a house. 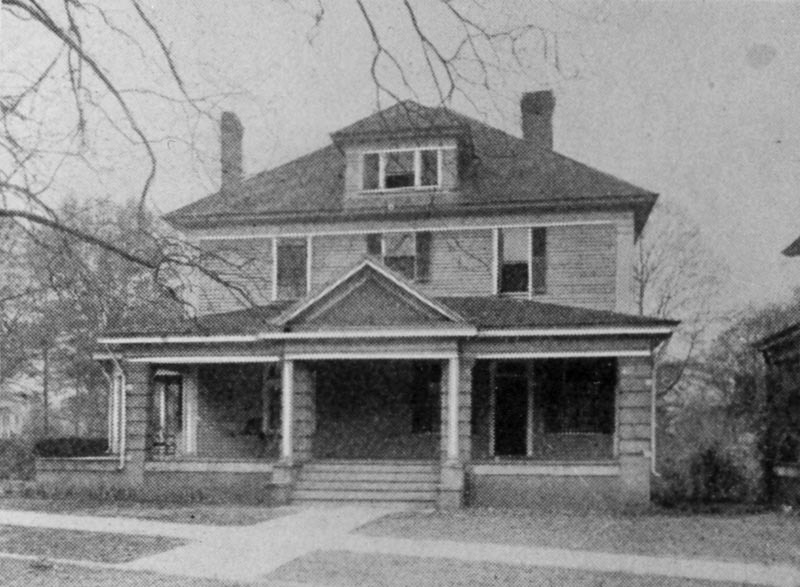 The chapter constructed a house in 1917 on University Avenue (now Boulevard) on the site of the present Beta Theta Pi house. Our current house is located at 332 University Boulevard in between Kappa Alpha Order and Phi Kappa Psi. Claude A. Allen (University of Georgia Alpha Beta, 1884), Henry A. Jones (The University of the South, Sewanee, Tennessee Omega, 1878) and General John R. Kennedy (Cumberland University, Tennessee Lambda, 1869) founded the Beta Delta chapter of Alpha Tau Omega in 1885. The first initiate was Judge John C. Pugh, 1885, the son of one of Alabama's two United States Senators. The early initiates also included members of Alpha Gamma, a regional fraternity of 21 chapters throughout the south. Alpha Gamma was approached by several national fraternities but chose to join Alpha Tau Omega. Alpha Gamma existed sub-rosa at The University of Alabama during the university fraternity ban from 1857-1885. William "Big Bill" Little, 1889, is listed in official University of Alabama records as the "Founder of Football" at Alabama and as its first team captain. Everyone wanted to be in the same fraternity as "Big Bill", and ATO was known as the "athlete's fraternity". 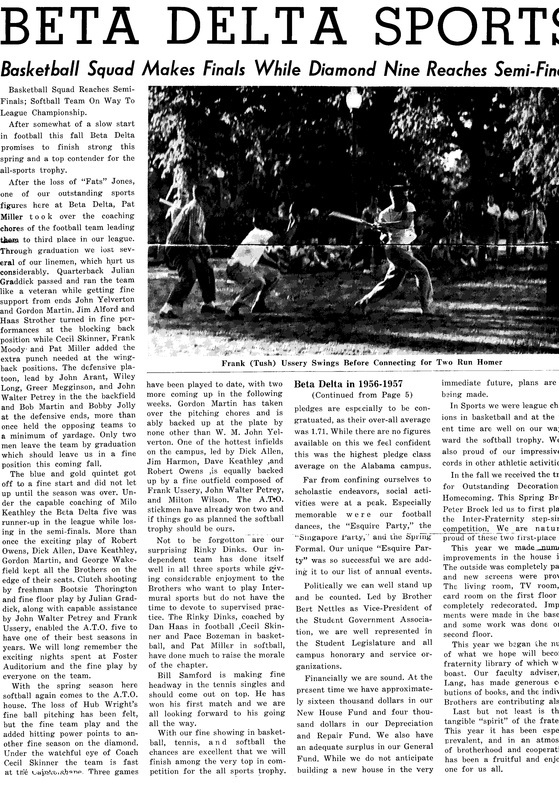 Many of the football and baseball stars of the 1890s and 1900s were Beta Deltas. 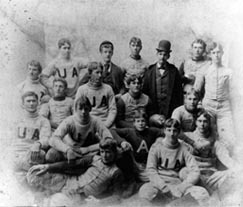 Captains of the UA football team were generally ΑΤΩs, such as B. Auxford Burks, Jr. M.D.,1902, Alabama's first star running back. The first University of Alabama major league baseball player was Del Pratt, 1907. Del played for the St. Louis Browns, New York Yankees, Boston Red Sox, and Detroit Tigers. He was the clean-up hitter in 1920 behind Babe Ruth in "Murderers Row" and batted .314. Beta Delta moved into its first fraternity house in 1910 on Queen City Avenue between the campus and downtown Tuscaloosa. We were one of the first fraternities at UA to have a house. The chapter constructed a house in 1917 on University Avenue (now Boulevard) on the site of the present Beta Theta Pi house. Richard C. Foster was elected president of the UA freshman class in 1910, and was initiated into ΑΤΩ in 1911. 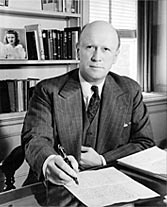 Brother Foster went on to graduate from Harvard Law School and served as President of the Southeastern Conference, and as President of The University of Alabama from 1937-1941. President Foster died suddenly and tragically while in office. On Sunday, November 15, 1941, he began experiencing numbness in his legs and he died on Thursday, November 19, at the age of 46. Foster Auditorium is named in his honor. Other notable ΑΤΩs of the era were Alabama Supreme Court Justice Thomas C. McClellan, 1890, UA Professor Shaler C. Houser, 1895 for whom Houser Hall, a UA School of Engineering building is named, DeVane Jones, 1909, and George Cabell Outlaw, Sr., 1915. One of our own, William P. Spratt, 1904, gave his life for our nation in World War I. ​America began the decade in the midst of the "Roaring Twenties". Denny Stadium and Denny Chimes were constructed in 1926, the same year Lawrence A. Long was initiated into Beta Delta. 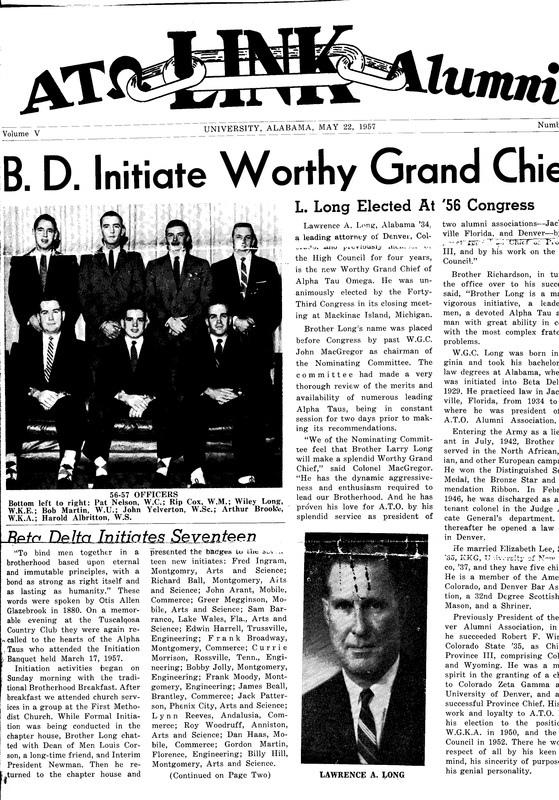 Brother Long later became the Worthy Grand Chief (President) of ΑΤΩ National in 1956. Elton B. Stephens was initiated at Birmingham Southern College, Beta Beta, 1929, and attended law school at Alabama where he was active in Beta Delta. McDonald Gallion was initiated in 1931, and went on to be elected twice as Alabama's Attorney General. W. Edward Lear, Cincinnati, Delta Lambda, '38, transferred to UA in 1938 because of the strength of Alabama's School of Engineering. In the 1960s Brother Lear returned to UA as Dean of the College of Engineering and remained in that position for many years. Five Alabama ΑΤΩs made the ultimate sacrifice for our nation in World War II: Captain Samuel Perry, 1927; Ensign Frank Philabert Jr., 1935; Lt. Edwin King, 1936; Lt. Edgar Penney, 1939; and Lt. C.H. Whitfield, 1942. We honor their memory. 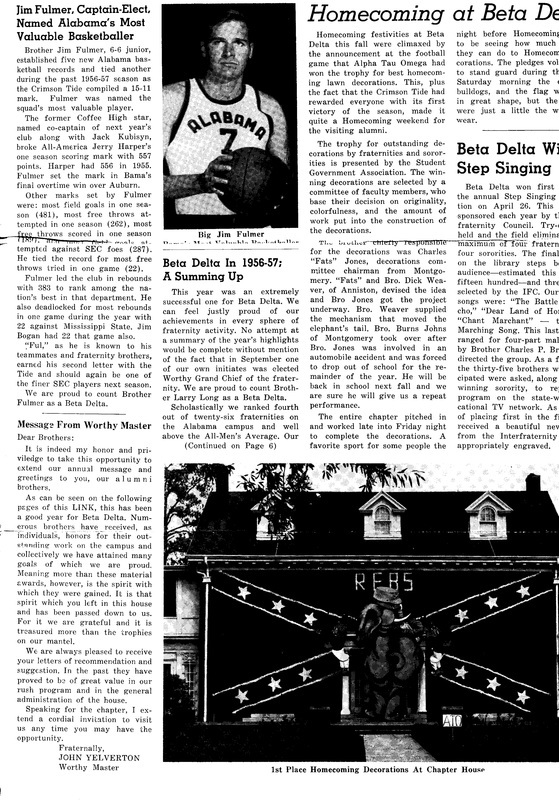 There was a post-war boom for ΑΤΩ at Alabama. With the boys back home, the UA campus and the nation were in high spirits. In 1946, there were 134 men in the chapter. 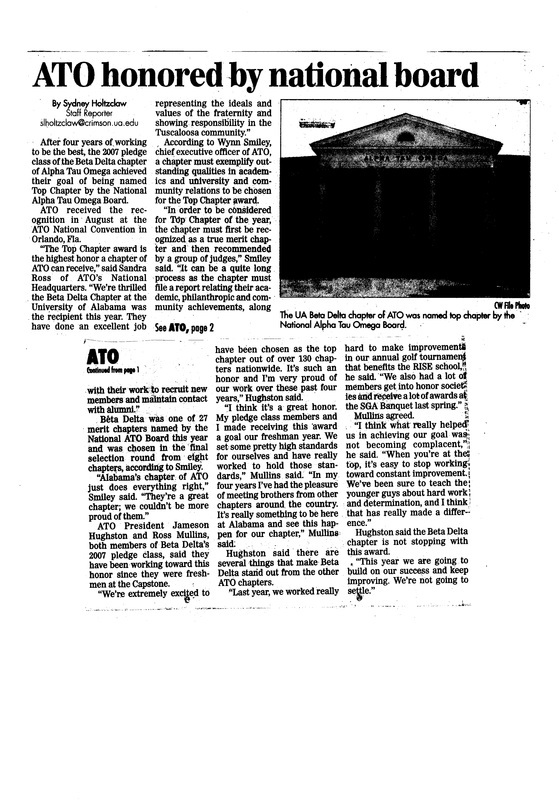 ATO had a virtual "Who's Who" of campus leaders; Stan Starnes; Drew Redden; Tom King; Bill Hairston; Yetta Samford; and George Shirley, among others. A 1946 initiate, John Patterson, was later elected Alabama's Attorney General, Governor and Judge on the Alabama Court of Criminal Appeals. ΑΤΩ and Kappa Alpha fraternity had houses next to each other on University Avenue. The friendship between the two fraternities was such that its members often ate dinner at each other's house. The annual KΑΤΩ Party was an event on campus. The chapter enjoyed its largest membership to date between 1946 and 1949. 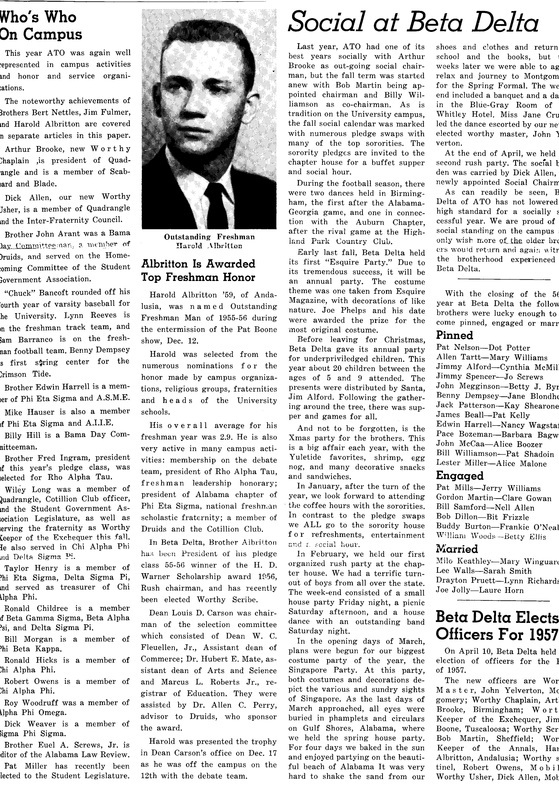 The period started with the election of Tom King, '42 as Beta Delta's first President of the UA Student Government Association (SGA). Brother King had served in WW II and was a law student at the time of his election. 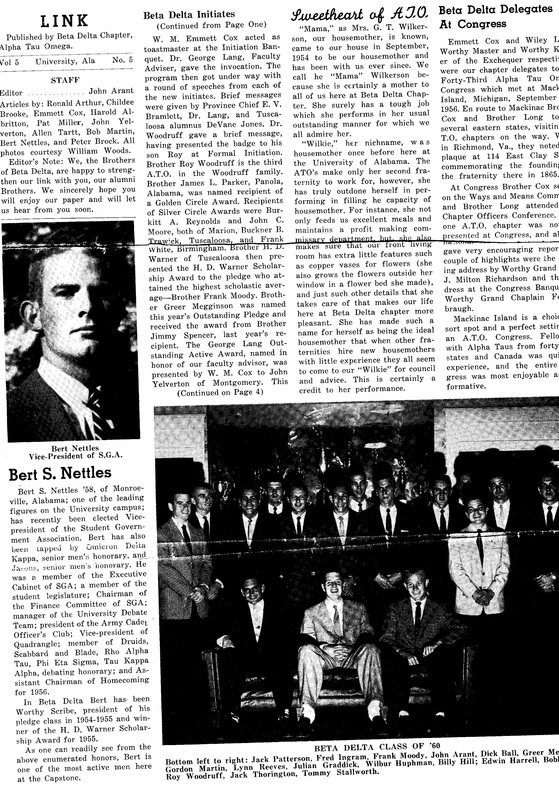 Two years later Johnny Wilson, '51 was Beta Delta's second SGA President. Music known as rock 'n roll brought a vast change to the nation and the world. A gyrating singer out of Memphis, Elvis Presley, became the symbol of a generation. The era of Big Bands had come to an end. In 1958, Coach Paul "Bear" Bryant came back to Alabama, his alma mater. The Tide had suffered through several losing seasons and Coach Bryant, when asked why he left Texas A&M for Alabama, replied, "Mama called." 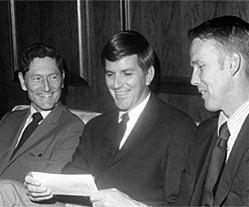 Alabama won three national titles in the 1960s and three national titles in the 1970s under Coach Bryant's leadership. The 1960s brought the British invasion to the United States, led by the Beatles. Electric guitars became the staple in bands throughout the world. The revolutionary sound converged with the growing opposition among those under 30 to the war in Vietnam. Throughout the 1950s, 1960s and 1970s, the majority of the chapter members were from Montgomery or Birmingham. Our main competitor for chapter members in Montgomery was SAE, and in Birmingham, Phi Delta Theta. Huntsville emerged as a fertile recruiting ground in the 1970s. ΑΤΩ and Sigma Nu had an annual party each year. Our sister sorority on the UA campus was Alpha Gamma Delta. The chapter house on University Avenue was in dire need of repair in the early 1960s. There are different versions of the reason why the chapter decided to leave a prime location on University Drive to construct a house across campus on Jefferson Avenue (aka New Fraternity Row). One version is the University would not allow the chapter to construct a new house because the administration wanted to develop New Fraternity Row. Another version is the UA administration indicated that future campus expansion would take place in the immediate vicinity of New Fraternity Row, thus making the location of our new house appealing. (Note: Until the 1990s most of Alabama's marquee football games were played at Birmingham's Legion Field, and the popularity and pageantry of the quad on football weekends was not on anyone's radar. Also, a great deal of new campus construction since 1966 has, indeed, been in the area of New Fraternity Row and to the east toward McFarland Boulevard). In any event, ΑΤΩ constructed and moved into a new house on Jefferson Avenue in 1966. The house cost roughly $225,000.00 to build and had approximately 15,000 square feet. A dedicated group of alumni went on the house Note to guarantee payment. There were 20 rooms in the house, with two men to a room. About half of the 80 men in the chapter generally lived in the house. Band parties were held in the downstairs party room. (A party room addition in the rear parking lot was constructed in the early 1980s). With the Vietnam War raging, the late 1960s and early 1970s was a time of upheaval in our nation and on college campuses everywhere, including Alabama. The hippie culture swept through society and fraternities suffered in popularity. Chapter membership fell to 55 in 1972. 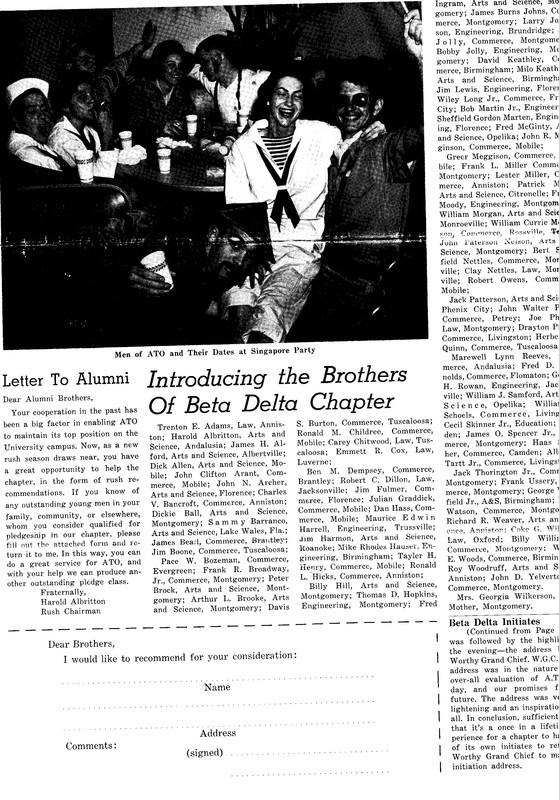 In 1974, we had joint parties with KA, ZBT and SAE. Brother Roger Lee, '69 was elected Beta Delta's third SGA President in 1972, and Vaughn Stewart, '75, was elected our fourth SGA President in 1979. Chapter membership rose to around 100 by the end of 1979. Chapter membership settled in the eighties range throughout most of the 1980s. The 100th Anniversary of our chapter was held at North River Yacht Club in October, 1985. A band party followed at the ATO house. Former WM, Lt. Hunter Mixon, '84, was killed in 1988 in a helicopter accident while serving in the U.S. Army. In the late 1990s ATO National replaced its Province Chief/Chapter Advisor system with a Board of Trustee system to increase alumni involvement. In the latter part of the 20th century and first part of the 21st century cell phones swept the world. Personal computers, PCs, became affordable for American families, the worldwide web changed the way we gather and disseminate information, and emails became the norm for rapid communication. FACEBOOK and MySpace added a new dimension to social networking. 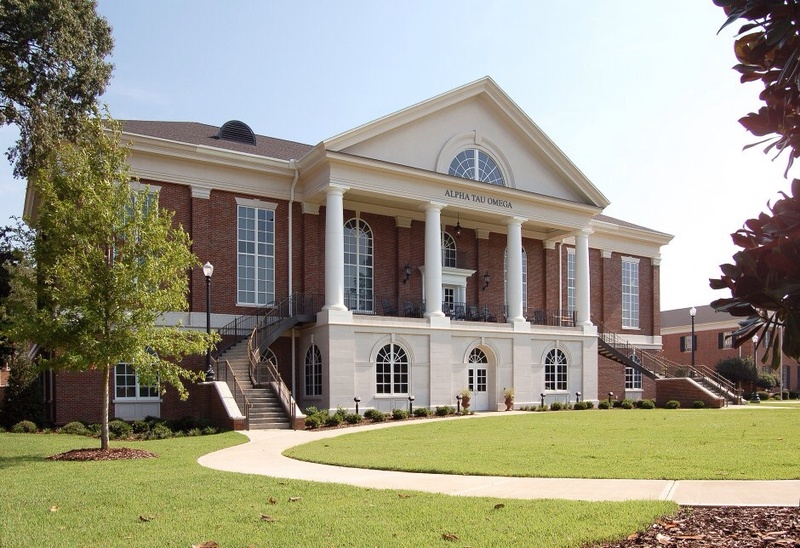 Beginning in 2004, The University of Alabama, under the leadership of UA President Dr. Robert Witt, began a massive building campaign with an eye on increasing student enrollment. Riverside, Lakeside and Ridgecrest dormitories were constructed, as well as campus buildings and additions to Bryant-Denny Stadium. UA enrollment increased from 21,000 students to over 28,000 by 2009. Josh Payne, '02 was elected President of the Student Body at Washington & Lee University in 2007, while attending law school. The Beta Delta Board of Trustees was expanded to 13 in 2008, with talented and interested alumni. Hubert Kessler,'60 became the Chairman, and Judge Alan King,'71 became Vice-Chairman and in charge of Alumni Relations. The board, which met on a monthly basis during the academic year and once during the summer, consisted of alumni from every decade, 1940s through 2000s, and Margaret Garner, a UA faculty member. The Board of Trustees committed to an alumni relations program by contracting with a company to publish the chapter newsletter, The Link. ΑΤΩ received the UA Order of Omega Fraternity of the Year Award in 2007 and 2008. Our chapter also received the UA President's Excellence Award in 2008, and the UA President's Fraternity of the Year Award in 2009. On behalf of the Board of Trustees, Judge Alan King, '71, made a presentation to Dr. Robert Witt in February, 2008 for UA to allow our chapter to construct a new house on University Boulevard. Afterwards, at the suggestion of Dr. Witt, the Beta Delta Board of Trustees and House Corporation engaged a capital campaign company out of Kansas to conduct a feasibility study to gauge alumni interest in building a new chapter house. In April, 2008, the chapter held the Amos Burns Ball at SoHo Square in Homewood to recognize Amos,'49 for over 50 years of service to Beta Delta and to ΑΤΩ National. In addition to serving our chapter, Amos served for many years as Province Chief, Chairman of the High Council and as a member of the ΑΤΩ Foundation. In October, 2009, Judge King prepared and submitted a 58 page Application to the University for our chapter to build a new house on what was referred to as the "Rotary lot" on University Boulevard. ​At the 78th Biennial Congress in Louisville, Kentucky in July, 2008, Walter Hughes,'60 became the second Beta Delta President of ΑΤΩ National. In February, 2009, The University of Alabama awarded Beta Delta the "Rotary lot", beating out several other prominent fraternities who had submitted Applications. Sam Faucett, '53, who had served for many years as either President or Treasurer of the House Corporation before stepping aside a few years earlier, again became President of the House Corporation. Barrie Harmon, '66 and Tom Curtin, '74 became the co-chairs for the capital campaign, and Walter Monroe, '63 began working closely with University administrators, the architects and the contractor to construct our new house. In the fall semester, 2009, our chapter had its largest membership to date in our history with 151 actives and pledges. In August, 2009, BOT member, Jim Kennemer, '69, became the Treasurer of the board, Denny Hughes, '86 became the BOT judicial liaison to the chapter and Josh Payne, '02 became the liaison to the pledge class. For almost every semester during the 2000s, Beta Delta had the highest GPA among fraternities. The chapter has a fall semester membership (actives and pledges) of 161 young men. ΑΤΩ Beta Delta dedicates its new house on September 18, 2011. ΑΤΩ Beta Delta is named the UA Order of Omega Fraternity of the Year for 2012-2013. ΑΤΩ Beta Delta sends a group of men to celebrate the 150th year of ATO nationally and receives a True Merit bowl at the ATO Congress.